Although Firmata is a very complete firmware for the Arduino board, from time to time we find ourselves needing extended funcionalities and wanting to use devices not supported by default by the protocol, such as LCD screens. In these cases, we are going to need to extend the Firmata firmware and build additional blocks in Snap4Arduino that mirror these new functionalities. Take in account this is a tutorial for advanced users. Modified firmwares for different devices will soon be featured in our official site along with their Snap4Arduino XML files containing the corresponding new blocks. In this example, we are going to modify the firmware so it can receive a new command that just turns a digital pin on. This functionality is of course completely useless, but is easy enough to understand and can be the foundation for any other complex behavior we need to implement. 0x08 is the name of the new SYSEX command we have just added. In StandardFirmata, commands from 0x08 to 0x0F are free for us to use. argv contains the first argument passed to this function, in our case it will just be the pin number. Notice how further arguments can be accessed just by increasing this index. Believe it or not, we are done here! You can now compile and push this sketch into your board. 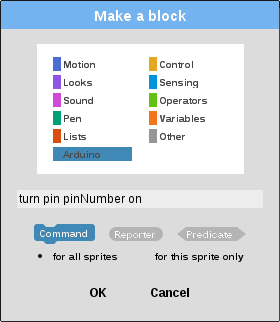 So, how do we trigger this new command from within Snap4Arduino? 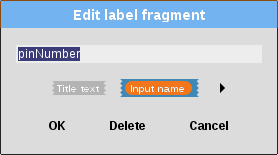 Next, select the category you want to add the block to -Arduino in our case- and type in the block name. Notice how you can type arguments here too and deal with them later. And there you go, the LED has just been lit up!